As many of you loyal readers know (thanks Mom!) I'm a big believer that success in life, as in innovation, is about understanding the future and bringing products and solutions to the market just as the market realizes its needs. This builds on the famous quip that to win the future you should create the future. The unspoken but obvious counterpoint is that you can wait to see what the future holds and then react to it. Many is the company that has decided to take the more passive, reactive, wait and see model, rather than invest a few dollars into trend spotting and scenario planning. Why aren't we doing more work on understanding and predicting the future? It's pretty obvious that most companies aren't good at understanding and predicting the future, and they are so bound up in efficiency and quantitative metrics about the next month or quarter that they don't believe they have the time or insights to get it right. There's a famous quote attributed to Niels Bohr, a renown physicist, who said it is very hard to predict, especially about the future. Contrast that quote with one of my favorites, by William Gibson. Gibson is quoted as saying "the future is already here, it's just not evenly distributed". What he meant was that there are events and trends underway in some corners of the world that are advanced and futuristic. Imagine how primitive tribes in the Amazon jungle think about airplanes. In the same way imagine how your grandparents think about Snapchat and Facebook. Signals about the future are all around us. Some places (Tokyo and Dubai come to mind) feel like they are already a few years or even a decade ahead of us. What's required is for us to identify the trends that are occurring and make sense of them, to visit the places that are moving forward and experimenting, to see what the future might hold. I've coined what I call the "straight line" future, from my work with customers in trend spotting and scenario planning. When we ask people to imagine what the future will look like 3-5 years from now, most people will imagine a future that looks and feels exactly like the one they are living in, with minor tweaks around the edges. In other words, the journey from here to there is a straight line with few disruptions or deviations. This is the future that we expect and want if we are comfortable and don't want uncertainty or risk. This is not what is going to happen. Just a few years ago, Obama was president and the thought of Donald Trump becoming president would have seemed laughable. Hillary Clinton seemed likely to win and there were an acceptable range of leading, plausible Republican candidates. Yet history and fate intervened and we have a future few would have expected, with very different political, economic and perhaps military consequences. The future will look subtly different than the present does, in ways we often don't anticipate or expect. Those companies that discover the differences with enough time to create valuable products and services will win big. Bill Gates of Microsoft fame said that we often overestimate the change that will occur in the next 2 years and underestimate the amount of change that will happen in the next ten. With the pace of change accelerating, we might make that 2 years and 5 years, as you'll see further down the page. The point of this post is that change is happening very quickly, and companies that wait to react to emerging events simply cannot react fast enough, with products and services that are compelling enough to win. Rather than wait, you must create and shape the future that you want to participate in. Much of the information and signals about the future are out there, waiting to be discovered. Don't fall into the trap of plotting "straight line" futures, because they aren't real. Small, subtle changes in the economy, technology or society will create new customer segments, new needs and introduce new threats and potential product or service substitutions. Think this can't happen very fast? iTunes was first released in 2001 as a way to store and manage music. It was the first really successful commercial way to acquire and manage digital music files. Tower Records, the largest distributor of CD and albums, declared bankruptcy five years later. An entire music industry and major distribution channel was destroyed in only five years. And this didn't happen without clear signals. Napster and other music sharing platforms proved that customers could strip and share music files for years before iTunes was released by Apple. The future, as Gibson said, was out there, just not widely recognized or distributed. I saw a sign in my Twitter feed recently that spoke volumes about innovation culture. Let's contemplate the audacity of suggesting an idea about a movie full of sharks in tornadoes for just a moment. 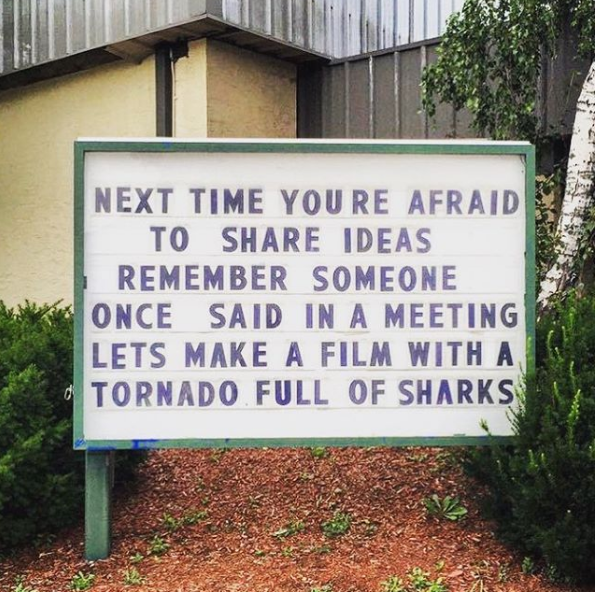 To suggest a movie about sharks in a tornado demonstrates creativity. Good innovation often happens when you combine two unexpected attributes or components together to create something new. In this case I think everyone understood that Sharknado was over the top. And why not? If you look at the rest of the movies being made, something a little tongue in cheek makes sense. The first thing to take away that someone in Hollywood did right from an innovation perspective is making unusual connections. But beyond the idea of combining unlike objects, imagine the guts it takes to suggest something so new and unusual. In many organizations even reasonable ideas get shot down very quickly. Participants will wonder about profitability or ROI. Others will question customer demand or technical feasibility of ideas that seem possible and not outlandish. That's because all of the possibility and "wonder" has been squeezed out of us in the corporate world. The vast majority of people live lives of quiet desperation, recognizing opportunities but quickly looking away, aware of the challenge to create new ideas or the price one might pay for suggestion them. What environmental, economic, and emotional conditions must exist for people to suggest outlandish ideas? Now, place yourself back in that setting, where some low level production assistant has just suggested making a disaster movie, one that places sharks (looking back to Jaws and other killer aquatic animals) in tornadoes (again, looking back at classic disaster movies). The idea combines two traditional Hollywood tropes, but in an unexpected way. You'd think even Hollywood producers would have laughed the idea out of the room. But they didn't, and that's why Hollywood creates more stuff (that's good and bad) than most other organizations and industries even contemplate. Some producer or producer's assistant had the guts to say: tell me more. Rather than shooting down an idea that marries two very unlikely protagonists, someone accepted the nearly impossible idea and said, go further. This is what divides innovators and creatives from the realists and the execution-oriented folks. Realists and operationalists would scoff. They'd say "Sharks don't get caught up in tornadoes" or "That's unrealistic, no one would believe it". Yet today we walk around with more processing power in our smart phones than a spaceship had that carried men to the moon. We in corporate America need to regain a sense of wonder and possibility. We need to stop thinking about what customers need next week, and start imagining what they'll be doing or what need they'll have in 3, 5 or 10 years. Some of you reading this will argue that it's Hollywood's job to create funny, compelling, mindless entertainment, and that means stretching the genre or combining or creating really different concepts to attract and retain an audience. But isn't that also our jobs in corporations? To create really interesting and valuable products to attract the attention and revenue of new and existing customers? Do we really think that in a time and place where change happens so frequently, societal norms and tastes shift rapidly, where information flows so freely that we can win by developing safe, me-too products? Did AirBnB or Uber create a safe, me too product, or did they dream up something new, audacious and quite different that clearly threatens the existing industry players? Corporations, in all industries and of all sizes need to get some of this Hollywood spirit, to foster new and outrageous ideas, to encourage new growth, to create new and interesting products and services for customers. We need a little more Sharknado thinking in corporate America, and to get it we'll need a lot more Hollywood style interaction - mixing unusual stuff together, extending ideas or concepts beyond the breaking point, being willing to generate and speak out loud really outlandish ideas, with the sense that someone will say: tell me more. The people in Hollywood aren't that much more creative than the folks you'll find in many Fortune 500 companies, but they have an expectation and culture of creating new things, and a tolerance and expectation of failure and experimentation that many companies lack. As a sometimes writer of blogs, white papers and even a few books, I understand the challenge of facing a blank page, trying to form the words into meaningful and insightful sentences. A lot of times the concepts and ideas that sound so good in my head get misplaced and mis-translated on the page or simply don't ring with the same clarity when written that they seemed to have when I thought about them. Writing in any form is a challenge, and increasingly I think writing is very similar to innovation. Writing, after all, is the act of dreaming up something new to say about something old, bringing new concepts or new stories to light in a new way. Writing, like innovating, is creating. What's more, writing, especially stories, takes real creativity. Tolstoy wrote that there are only two basic story lines: a person goes on a journey or a stranger comes to town. When you think of the diversity of stories, the creativity it takes to make them compelling and the range of story types, characters and plots, you can easily see that writing is creativity and innovation. So perhaps we innovators can learn something from good writers. It turns out that many writers don't think they know much about writing. Joe Fassler, who wrote the article that prompted this post, says that many authors find writing difficult, frustrating and challenging. Even those that you would think are "experts" describe their struggles. Steven King, Amy Tan and others talk about writing and re-writing, often rethinking and reworking their ideas and stories over and over again. Reading Fassler's article made me think of my own writing and how it relates to innovation. There are a number of interesting parallels. First, when writing an article, blog or story, the author must have an interesting story to tell, a new perspective, and make the story as interesting as possible to the potential reader. In the same way an innovator must target customers who have needs, and shape ideas into new products or services that customers want to buy. Second, authors will tell you (and they do so repeatedly in the article) that first drafts are for discovery and experimentation. These drafts identify gaps and weaknesses and potential areas of opportunity or discovery. Amy Tan notes that she throws out 90 to 95 percent of her initial work. Innovators face the same challenge, but often have very different expectations. In business we think because we have detailed processes and deep experience, we should get ideas right the first time. Instead we should learn to diverge and converge and iterate until the ideas achieve their correct shape, but time and cost pressures rarely allow innovators to fail, restart and reshape ideas. Finally, the article says that the artistic process never gets easier. Even experienced authors struggle with phrasing, story lines and plots. They constantly work at their craft. Innovators could learn from this dogged determination. Most innovators arrive unready and unseasoned, attempt to perform an innovation activity quickly, declare victory once they've defined a new product or service, and return to their regular jobs. They don't hone their innovation skills and are surprised when innovation is difficult or requires learning, discovery and iteration. One author described being "paralyzed by her thoughts". This statement made me think of many people in idea generation or brainstorming sessions who are unable to generate ideas in the moment, placing far too much pressure on themselves to get an idea right. The pressure we place on ourselves as writers or innovators is often detrimental to creative thinking. The author of the paper sums it up nicely when he says "I’ve learned, bigger feats, bolder ideas unfold over the long haul—in the space where success feels uncertain, even unlikely". Good innovators recognize the agony and humility in this statement, but the best ideas do take time and require hard work. One final quote that I think captures both writing and innovating: "I'll keep at it stubbornly and gladly until the job is finished". Innovators and authors have similar jobs and similar challenges. Most authors write because of a passion for a story or an idea, and learn to iterate and rewrite/rework. Most true innovators also have a burning passion for an idea or a problem, and most successful innovators are more than willing to describe their experiments, their failures and their iterations that ultimately led them to success. We need to understand how these two jobs are similar, and what authors and innovators could learn from each other.